Which types of funding can I receive from the VIP for holding conferences for international early-stage researchers at the Viadrina? You can receive funding for many aspects of holding conferences for international early-stage researchers at the Viadrina. It is possible to receive a travel and subsistence allowance for international PhD students of universities abroad that are attending the conference. In addition, it is possible to apply for funding for marketing, publicity and catering. How many international PhD students of universities abroad can I invite to the conference? The exact number of international PhD students participating in your conference, depends on you and your intended conference. You can receive funding, from the VIP, for the support of international PhD students of universities abroad. You are free to decide for how many international PhD students of universities abroad participating in your conference you would like to apply for travel and subsistence allowance within the VIP. Should there be a reason that more than 4 international PhD students should receive support from the VIP, please explain this in your application. Is it possible for the transfer of a grant for holding conferences for international early-stage researchers at the Viadrina to a professor of the Viadrina? 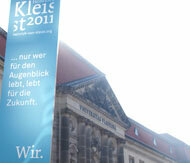 No, it is not possible to transfer funds to a professor of the Viadrina for financial reasons. However, the funds can be paid to the applicant. The payment of travel and subsistence allowances to participating international PhD students of universities abroad of conferences for international early-stage researchers at the Viadrina can be also made by the project coordination. In this case a consultation with the project coordination should be made. Is a funding of travel and subsistence allowances of international PhD students doing their doctoral at another German university possible? No, within the VIP only travel and subsistence allowances of international PhD students of universities abroad can be funded. Is it possible for the application for holding conferences for international early-stage researchers at the Viadrina to be made by a team? Yes, the application can be made by the organizing team. Please state this in your application. Can I apply for a grant to attend a conference abroad? Unfortunately it is not possible to apply for a grant to attend a conference abroad from the VIP. Do I have to submit all the relevant documents in my application? Yes, it is necessary to submit all the relevant documents for your application for holding conferences for international early-stage researchers at the Viadrina. This is to ensure that all applications are given equal consideration. Is it possible for Postdocs and Professors to attend my conference? This is possible; however, grants can only be paid to international PhD students of universities abroad.